Craft this scarf using 12 mm needles and 200g Chunky weight yarn. 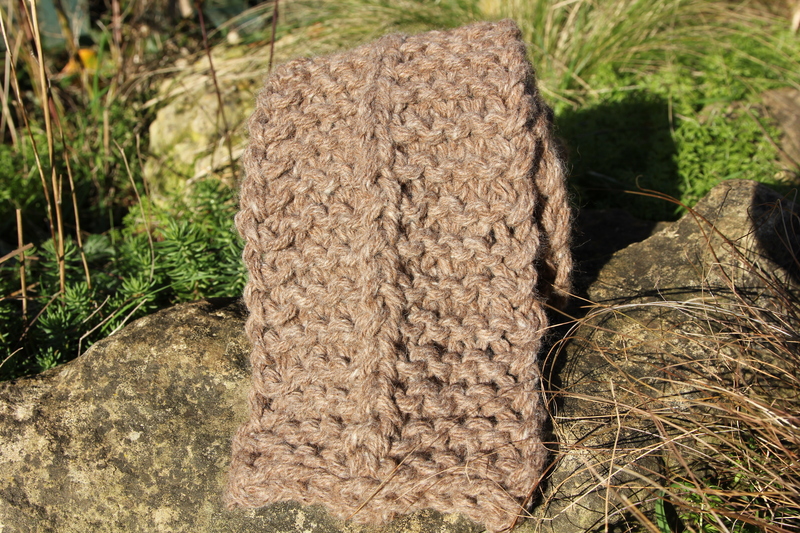 I used Toft Wool/Alpaca mix in Camel. ::: right side row – Slip first stitch knit-wise, knit 9, slip last stitch knit-wise. ::: wrong side row – Purl 1, knit 4, purl 1, knit 4, purl 1. Step 4 – Keep going until scarf is desired length, cast off. Here’s a link to the pattern info. on Ravelry. This is a free pattern. Please let me know if you make a version or if you find any mistakes. This is my intellectual property, don’t use the pattern to your commercial advantage without asking first and then, you know, gaining permission. I retain the moral right to be identified as the author. Previous Post As well as feathers, my jungle has fur. It was designed to protect my better half on his bicycle/train/tube commute, after a few iterations the final version seems to have been well received. Family are the harshest critics!